Globally, 90% production of rice is in Asia, and Indonesia is third largest producer of rice and one of the top importers due to use of non-optimal farming techniques by the farmers that result in limited supply of rice, combined with huge rice consumption by massive population, which was 150 kg in 2017. Small farmers and landholders acquire around 90% share among the major cultivators of rice instead of government/privately owned enterprises. Indonesia imports rice mainly from Thailand, Vietnam and India. Rice imported from Vietnam is of premium quality, and Indonesia produces only medium quality rice. In 2018, it is expected to import 500,000 tons rice from Vietnam. Rice import and export is controlled by the government of Indonesia that ensures price stability and maintaining the rice reserves. In order to become rice self-sufficient country, government steps up by proving subsidized fertilizer and stimulating for the use of advanced technology, and through campaigns promoting the other staple crops to reduce rice consumption such as ‘one day without rice’ (each week) campaign. Geographically, South Sumatra was the top rice producer, followed by West Java, Central Java, East Java and South Sulawesi. Goldstein Research analyst forecast that the Indonesia rice industry is expected to grow at CAGR of 2.71% over the forecast period. Indonesia rice production was estimated at 80 million metric tons in 2017. The factors such as government support in rice production, favorable climatic conditions, rising number of rice producers, developed infrastructure are majorly impacting the growth of Indonesia rice industry. 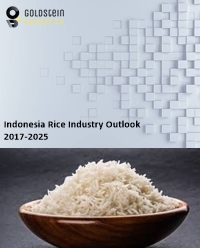 The report covers the present ground scenario and the future growth prospects of the rice industry for 2017-2025 along with the Indonesia rice production and revenue of Indonesia rice industry. We calculated the market size and revenue share on the basis of revenue generated from major players involved in rice processing across Indonesia. We have forecast the market on the basis of producers, suppliers and distributors, exporters and importers. On the basis of rice type, black rice accounted for largest market share in 2017 with 67.3% of total rice production. Black rice has high antioxidants, proteins, iron, fiber and no gluten, which has gained huge demand over the past 5 years. Further, white rice (milled rice) is most popular among the Indonesians, and thus over the forecast period milled rice is expected to grow at a CAGR of 2.9%. Rice industry outlook 2017-2025, has been prepared based on an in-depth market analysis from industry experts. The report covers the competitive landscape and current position of major players in the rice industry. The report also includes porter’s five force model, SWOT analysis, company profiling, business strategies of market players and their business models. Indonesia rice industry report also recognizes value chain analysis to understand the cost differentiation to provide competitive advantage to the existing and new entry players. In the era of technology advancement, there is trend of producing genetically modified (GM) rice to ascertain the quality of rice and food security. Though commercially there is no production of GM rice, but many varieties have been approved for commercial production which is expected to boost the Indonesia rice industry. Rice is a staple crop for 70% of the world and thus the demand for rice is expected to continue to grow over the forecast period. The food security concern all over the world is driving the growth of the Indonesia rice industry, where government has taken steps to become a rice self-sufficient country and an rice importer in future. Indonesia Rice industry report comprises of the following companies as the key players in the Rice industry: Luqman Hakim Noegroho Putro, Terry, Kaizen Agro Persada, ParadiGma, Bangkit Jepara Furn, PT.Tani Nelayan Indonesia, Comexindo International.